2011 BOAT SHOW PREVIEW • BAVARIA CRUISER 32 • Last summer, Bavaria USA introduced four new models to the U.S. market. The smallest of the fleet is the Bavaria 32, which packs a lot in a fairly small package. Designed by Farr Yacht Design, who designed all of the new Bavaria models, the 32 has a voluminous hull that makes the interior feel like you are on a 36-footer. But the boat is also very slippery through the water and extremely close-winded for a cruising boat. The 32 has an in-mast furling mainsail and a small roller furling jib. The jib is only 108 percent of the fore-triangle and sheets inside the shrouds. With tight sheeting angles, the boat sails to windward like a dream and tacks inside 80 degrees. Off the wind, the 32 is very easily driven and offers excellent speeds when broad reaching. Down below, the 32 is huge for a boat of this size. The master cabin has a large double berth tucked aft under the cockpit and a smaller double cabin forward for kids or guests. The benches in the saloon can double as berths, too. The galley is aft at the foot of the companionway ladder with the aft-facing chart table next to it. The L-shaped dinette will seat four for dinner. A great starter cruiser for a young family or a perfect downsize for an older couple who want to simplify their sailing life, the Bavaria Cruiser 32 offers great sailing qualities and a lot of living space below. Specifications: LOA 32’9”; LWL 29’0”; Beam 11’3”; Draft 4’11”; Displ. 11,464 lbs. ; Sail area 549 sq. ft. For more information, call 855-222-1120 or visit www.bavariayachts.com. BAVARIA CRUISER 36 • Like its little sister, the Bavaria Cruiser 36 feels much larger than its length might imply. In fact, this boat feels bigger when stepped aboard, when it is hit by a puff of wind, and when you go below into the cabin. The 36 has the same style rig as the 32, with an in-mast furling mainsail and a small jib that sheets inside the shrouds. 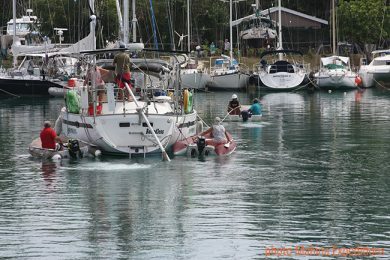 Because the headsail is small, the boat is easy for a couple to tack and the sail can often be trimmed without having to grind the sheet winch. The cockpit has long bench seats and the backs are ergonomically shaped to give lumbar support for comfort. Like all of the Bavaria Cruiser fleet, the 36’s transom folds down to create a large platform aft for sunning, swimming, donning SCUBA gear or climbing into the dinghy. The 36 comes in either a two-cabin, one-head layout or a three-cabin, one-head plan. The first will probably appeal to couples who sail with friends, while the latter will be a good layout for a family. The boat has only one head, but the compartment is large and has a partition that converts it into a shower. The interesting thing about the new Bavaria line is that owners have a lot of options when they spec out their new boats. You can choose from three different wood styles, floor patterns and numerous fabrics and colors. Bavaria has the capacity to build 3,000 boats a year, but they build each to its owner’s own personal requirements. The Cruiser 36 will make a great family cruising boat that is small enough to be affordable but large enough to really be a floating home away from home. Specifications: LOA 37’1”; LWL 32’5”; Beam 12’0”; Draft 5’4”; Displ. 15,432 lbs. ; Sail area 742 sq. ft. For more information, call 855-222-1120 or visit www.bavariayachts.com. The BAVARIA CRUISER 40 takes the company’s theme of large interiors in boats that sail very well and really puts it to great use. The 40 comes with only one accommodation plan—a three-cabin, two-head layout that emphasizes comfort. The 40’s rig is proportionally slightly taller and larger than that of the 36 and thus the boat has a bit more sail power. This boat will sail at 8 knots in 12 knots of wind, so you get the idea. The cockpit is large and laid out for easy sailing and outdoor living. With twin wheels, you always have a good view forward while steering or maneuvering around a marina. Plus, twin wheels open the aft end of the cockpit so you have direct access to the huge aft platform that is formed when the transom is folded down. The interior has the galley along the port side of the saloon with a dinette that seats six to starboard. There is a good-sized chart table aft of the dinette. With almost seven feet of headroom throughout the interior and plenty of overhead hatches and ports in the cabin sides and hull sides, the interior is flooded with natural light and extremely well-ventilated. The 40 will be plenty of boat for many couples or families since the sleeping cabins are so large, the heads so roomy, and the dinette and cockpit table well-designed for meals in all weather. Plus, the 40 sails very well indeed. Specifications: LOA 4’6”; LWL 35’3”; Beam 13’0”; Draft 5’5”; Displacement 19,135 lbs. ; Sail area 883 sq. ft. For more information, call 855-222-1120 or visit www.bavariayachts.com. 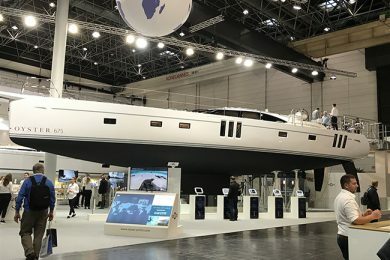 Bavaria builds three larger Cruisers—the 45, 50 and 55—but of these, only the CRUISER 45 will be in the U.S. this year. The 45 is a big boat for a 45-footer. In fact the transom and after sections of the hull are so wide that Farr Yacht Designs equipped the boat with twin rudders to go with the twin wheels in the cockpit. This configuration means that one rudder is always in the water and fully functioning even when the boat is heeled over and clawing to windward. Twin rudders also make the 45 sail as if it were on rails, with fingertip control at all times. The 45 has the same simple and efficient rig as the smaller boats, which drives it well even in light breezes. The cockpit is huge and has a drop-leaf table that will seat eight adults for a meal. The chartplotter can be installed neatly on the after end of the table, so it can be seen from both helms. The transom on the 45 has an electric motor to raise and lower it so you don’t throw out your back hoisting it into place. The platform is large enough for several people to sunbathe. Down below, the 45 can be arranged with either a three-cabin, three-head plan or a four-cabin, three-head layout. The galley runs along the saloon’s port side and offers an acre of counter space. To starboard, the dinette wraps around a handsome dining table that will also accommodate eight for dinner. The chart table just aft of the dinette faces aft and has a nifty folding seatback that is part of the dinette. The 45 will be a good family cruiser or will fit very nicely into a charter fleet. The cabins are large and comfortable, the living spaces huge and airy, and the eating arrangements great for crowds. The Cruiser 45 is a true liveaboard yacht. Specifications: LOA 46’10”; LWL 41’8”; Beam 14’3”; Draft 5’8”; Displ. 27,777 lbs. ; Sail area 1,151 sq. ft. For more information, call 855-222-1120 or visit www.bavariayachts.com. BENETEAU OCEANIS 41 & 45 • This fall, Beneteau will unveil two new Oceanis models that carry on the Oceanis cruising traditions while incorporating some truly innovative design features to make the boats easier to sail and more comfortable to live aboard. The most notable feature in the new design is the high cockpit arch that anchors the main sheet and provides a rigid frame for a dodger and other cockpit enclosures. Both boats are truly set up for indoor-outdoor living, so the cockpits are huge and access up and down the companionway ladder is excellent. The cockpits have twin wheels and an innovative folding transom system that fully encloses the cockpit when underway, then folds down electrically to form a swim platform when at anchor. Designed by Finot-Conq, the 41 and 45 have thoroughly modern rigs with the mast set fairly far aft and the headsail reduced to a slightly overlapping jib that sheets inboard of the side stays, which in turn have been moved outboard to the gunnel. With tight sheeting angles, the boats promise to be handy and close-winded while being easy to tack and jibe. For off-the-wind sailing, a reacher or asymmetrical chute will really add fun and power. The Oceanis 41 has three accommodation plans to choose from. The two-cabin, one-head version offers a good quarter cabin aft and a large V-berth forward; this plan has a huge sail locker and storage area under the port cockpit seat. The three-cabin, one-head plan uses the sail locker space for a second aft cabin. The three-cabin, two-head version tucks a second head into the forward cabin, which replaces the small desk or vanity found in the other accommodation plans. In all three layouts, the after head has a separate shower stall. The saloon remains the same in all three versions, with the L-shaped galley aft to port and the dinette forward to starboard. 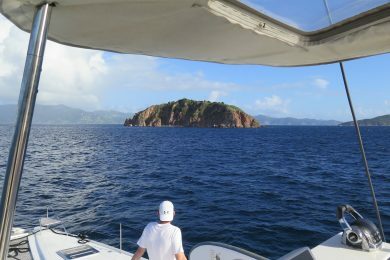 The Oceanis 45 is also offered with three optional accommodation plans. The two-cabin, two-head version has the same large storage area aft as seen in the 41. The three-cabin, two-head plan replaces the storage area aft with a second aft cabin. And, the three-cabin, three-head design equips each of the three cabins with its own en suite head; in this version, the shower stall in the aft head has been replaced with an expanded dinette storage compartment. Both of the new boats are being built in Beneteau’s plant in Marion, South Carolina, so they are truly American boats. The new designs will be fast, weatherly and very comfortable to live aboard. And they offer the great value that Beneteau is known for worldwide. 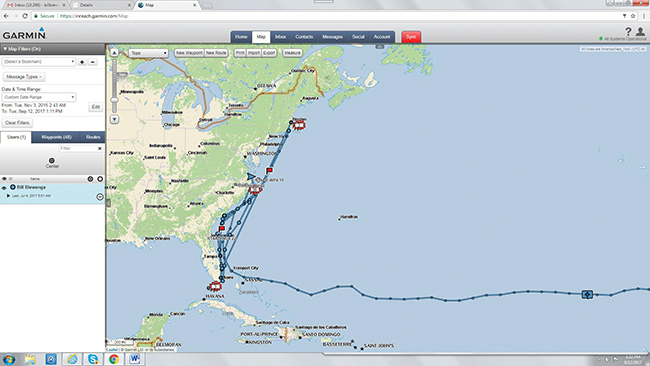 Oceanis 41 specifications: LOA 41’9”; LWL 38’1”; Beam 13’9”; Draft 6’9”; Displ. 18,386 lbs. 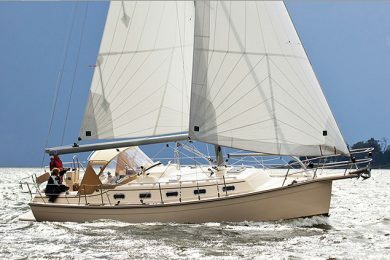 Oceanis 45 specifications: LOA 45’5”; LWL 42’10”; Beam 14’9”; Draft 7’1”; Displ. 21,054 lbs. For more information, call 843-629-5309 or visit www.beneteauusa.com. HAKE SEAWARD 46 • An innovative design from Hake Yachts in Florida, the new Seaward 46 is a shoal draft cruiser that is capable of extended offshore sailing. With a ballasted retractable keel and retractable rudders, the 46 can cruise in less than three feet of water. Yet, with the keel and rudders fully deployed, the boat will draw over seven feet and will be a stiff and stable platform for blue water sailing. 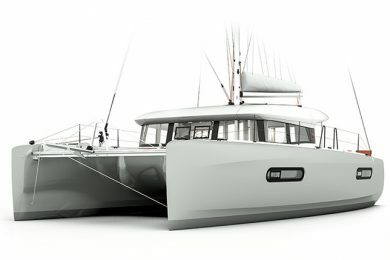 The big sister to the Seaward 32 and 26, both of which are shoal draft cruisers with retractable keels, the 46 is a raised deck saloon design with a large aft cockpit. The boat can be configured with either a single 75-horsepower diesel or twin 54-horsepower engines. And there is a “fishing” option that fits a fighting chair and rod holders at the stern. The 46 has a fairly narrow 13-foot beam and a small but handy rig with a 100 percent self-tacking jib, so it should be easily driven even in light airs. The 46 has been in the works for a while and has already stirred up a lot of interest since there are not many retracting keel cruisers on the market, with the exception of Southerly Yachts in England. 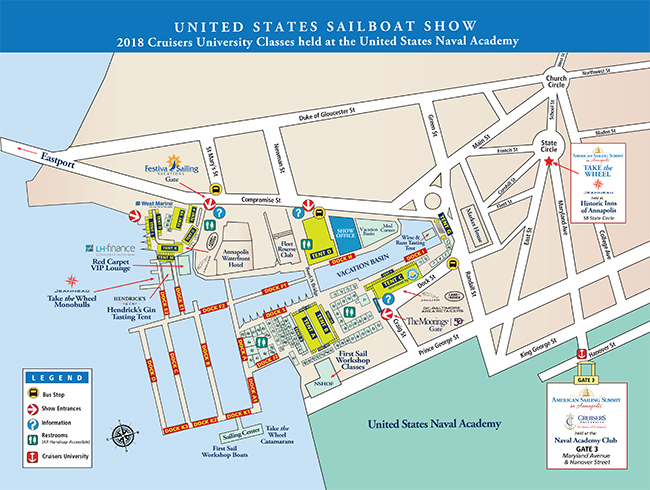 Look for the boat at the Annapolis Sailboat Show in October. Specifications were not available at press time. 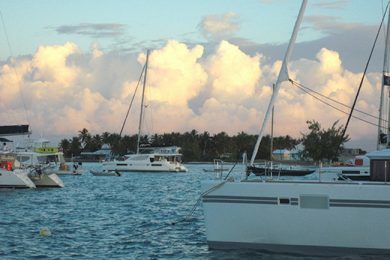 For more information, call 727-287-3200 or visit www.seawardyachts.com. HALLBERG-RASSY 372 • The new German Frers-designed Hallberg Rassy 372 is another cruiser under 40-feet that will appeal to couples and young families. The 372 replaces the popular HR 37. HR has built more than 8,000 cruising boats over the years, so it is well established as one of the world’s cruising yacht leaders. The new 372 is slightly longer, beamier and more streamlined below the water than the 37. The rig is more than a meter taller, and the sail plan has been configured to fly a large mainsail and a small headsail that will be easy to tack and trim. A self-tacking jib option is available. The three-spreader rig can be fine-tuned with the standard backstay adjuster, and the chainplates for the shrouds are far inboard, allowing tight sheeting angles and keeping side decks uncluttered. The 372 has a clean deck layout. The furling drum for the genoa is mounted below decks, as is the anchor windlass at the bow. Down below, the 372 offers classic HR quality with a U-shaped, seagoing galley, bench settees and storage for gear, groceries and spares. The chart table is across from the galley, while the head and shower are behind it. The forward cabin sports a large double berth, a vanity, hanging and storage lockers, and bookshelves. The after cabin has a huge double berth and additional storage. The 372 was voted European Boat of the Year in 2010. The new design is a fine example of the great work HR does and just how much you can fit into a sleek and speedy 37-foot hull. The HR 372 will make a great voyaging boat for a couple who like to sail fast and want to bring their comforts with them to sea. 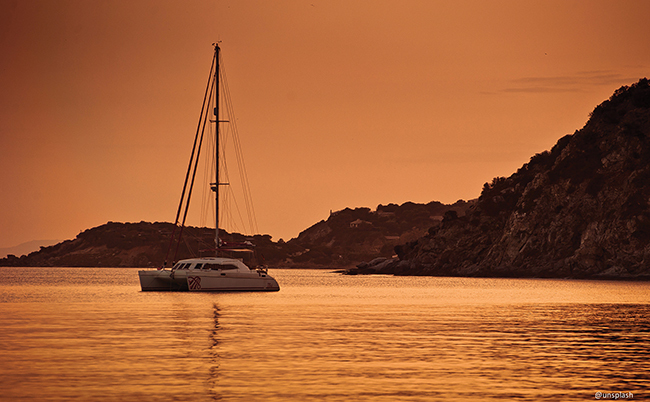 HANSE 495 • This year, Hanse will introduce several new models, among them the stylish and innovative 495. A powerful modern cruising sloop, the 495 has a Judel-Vrolijk hull with a nearly plumb bow and squared-off transom. The hull’s sheer is fairly straight, so the boat’s profile makes it look purposeful and fast. Think of that long waterline. On deck, the broad beam and low cabin house make the boat feel spacious. The cockpit is open aft, so the floor flows between the twin wheel back to the transom. The decks are uncluttered, and because the jib is a self-tacker on its own track, the chainplates and shrouds were moved outboard to allow unimpaired passages along the side decks. With teak decks and recessed hatches, a 495 will have a Wally Boat modern Euro look. Down below, the 495 offers a large owner’s cabin forward with a centerline double berth and plenty of storage space. The head and shower are in separate compartments port and starboard. In the standard layout, twin quarter cabins aft have good headroom and plenty of lockers. Ventilation is via open deck hatches and ports that open into the cockpit. The aft cabins are served by a single head to port that has a nice big shower stall. The standard saloon plan has the galley along the port side and the large U-shaped dinette to starboard with a bench amidships to seat two more guests. The chart table is just aft of the dinette and close to the companionway. The styling evokes modern European furniture, with contrasting light and dark woods, sharp angles and expanses of open floor. Hanse offers so many ways to customize your new boat that no two 495s will ever be the same. Fun to sail, comfortable down below, and a truly modern statement in cruising, the Hanse 495 will appeal to those who want the latest thinking and the ability to customize the look of their boat to a great extent. Specifications: LOA 50’6”; LWL 44’5”; Beam 15’7”; Draft 6’9”; Displ. 30,900 lbs. ; Sail area 1,390 sq. ft. For more information, call 978-903-0380 or visit usa.hanseyachts.com or www.hanseyachts.com. MOODY 45AC • Hanse Yachts in Germany bought the Moody brand several years ago and came out at once with a truly innovative deck saloon or pilothouse model that turned a lot of heads. Since then, the company has gone back to designer Bill Dixon for a more traditional aft cockpit luxury cruising boat to fit the Moody brand. The Aft Cockpit 45 is a modern sloop with a tall fractional rig and a sweet, traditional-looking hull with balanced ends and a springy sheer. 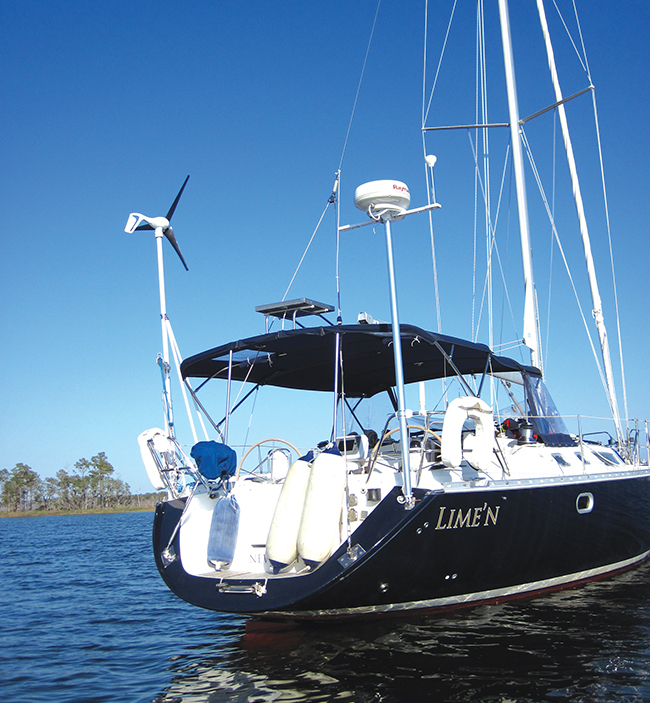 The full battened mainsail is standard, but in-boom furling could be added without degrading sailing performance. The jib is self-tacking and runs to a track athwart the forward cabintop, making upwind sailing a snap. The 45’s cockpit has twin wheels, a folding transom and a lovely varnished table with folding leaves. A low windshield wraps around the companionway, keeping spray out of the cockpit and providing a good base for a canvas dodger. Down below, the furniture is finished in varnished mahogany around accents of white panels and trim, so the whole effect is of traditional Bristol Fashion neatly modernized. Raised panel doors and drawers, some with wicker inserts to enhance ventilation, add a classic touch. The seagoing galley is at the foot of the companionway to starboard, while the head and shower are to port. Aft, the 45 AC has twin quarter cabins while the master cabin is forward with its own en suite head and shower. The dinette amidships is huge, and across from it are two easy chairs on either side of a small table that doubles as the nav station. Hanse has made a serious effort to offer Moody as a truly upscale brand that will appeal to sailors who want a well designed, fine sailing yacht that is finished to the highest degree. Specifications: LOA 45’0”; LWL 40’1”; Beam 13’8”; Drat 7’3”; Displ. 26,895 lbs. Sail area 1,205 sq. ft. For more information, call 978-903-0380 or visit www.hanseyachts.com. 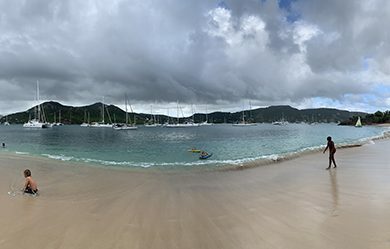 ISLAND PACKET 360 • Island Packet Yachts has been building seaworthy cruising boats for 30 years, and you will find them in the world’s best cruising grounds. With designer Bob Johnson’s Full Foil Keel, moderate sail area-to-displacement ratios, cutter rigs and self-tacking Hoyt Jib Boom Staysails, the line has a well earned reputation for easy motion in a seaway and high average speeds over the long haul. On IPY designs, you arrive at the end of the passage more rested than when you began. This year, the company is adding to its line a 36-footer that is an evolution of the handsome and sweet sailing Estero. The 360 is a salty and capable cruiser with a nice springy sheer, a short bowsprit that houses the anchors as well as the roller furling headsail, and a fairly low profile cabin that fits the hull neatly. The cockpit has been designed for comfort and safety, so it is not overly large and will drain quickly if ever a wave came aboard at sea. All sailing sheets, halyards and control lines run aft, so you never have to leave the cockpit to add or reduce working sail. The accommodation plan below offers a large double cabin aft with a neat V-style berth that allows you to swing your legs easily to the floor when getting up. This is a pleasant quarter cabin with ample ventilation, a hanging locker and plenty of space for clothes. The forward cabin has a traditional V-berth, hanging and storage lockers, and a private door to the large head. The saloon has the huge galley aft to starboard and an aft-facing chart table. The L-shaped dinette to port will seat four at the fold-down saloon table. Across to starboard, two swiveling easy chairs will make lounging, reading and watching TV just as comfortable as at home. A great mid-size cruiser, the new IP 360 is a go-anywhere blue water yacht that will look after her crew as a proper yacht should. 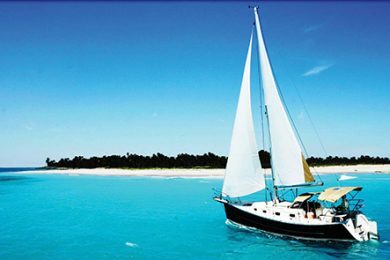 HUNTER e33 • Hunter has long been a leader in offering sailors a wide range of boats, from sailing dinghies to 50-foot ocean cruisers. But the company may be best known for its mid-size cruisers, which offer expansive living spaces in boats that are easy to sail and handle. The new e33 fits right into that mid-size segment and introduces an attractive new look for the Florida-based builder. With a sleek deck design and large cabin windows, the boat looks modern and fast. The hull has a wider transom than the earlier 33-footer and the bow has been given a narrower entry. The cockpit is large and comfortable for a boat of this size and has a neat fold-down transom that becomes a large swim platform. Hunter uses unique B&R rigs, with sharply swept back spreaders and no backstay. The main is quite large, while the headsail is small enough to be easy to tack. This rig is simple for a couple or even a singlehander to manage. Over the last decade, Hunter has steadily refined their interior arrangements and the fit and finish of the joinery down below. The e33 has a large athwartships double berth in the after cabin that is tucked in under the cockpit and side deck on the starboard side. The forward cabin has a V-berth and plenty of storage for clothes, linens and towels. The galley has Corian counters, a large fridge and a two-burner stove with an oven below. The dinette to port will seat four easily. To starboard, the bench settee with be a good berth, or the middle section of the bench can be converted quickly to form a chart table. All of the boat’s instruments are accessible from the starboard settee. A handsome addition to the Hunter line of sailboats, the new e33 offers a lot of accommodations in a cruising boat that will be easy to sail and comfortable for extended cruises. Specifications: LOA 33’6”; LWL 29’5”; Beam 11’6”; Draft 4’6”/5’6”; Displ. 12,400 lbs. ; Sail area 625 sq. ft. For more information, visit www.huntermarine.com. JEANNEAU 379 • The success of the Jeanneau Sun Odyssey 409 that was introduced at last year’s Annapolis show, with its hard chine aft, fold-down stern platform and simple but powerful sloop rig, primed the market for more Jeanneaus of the same style. 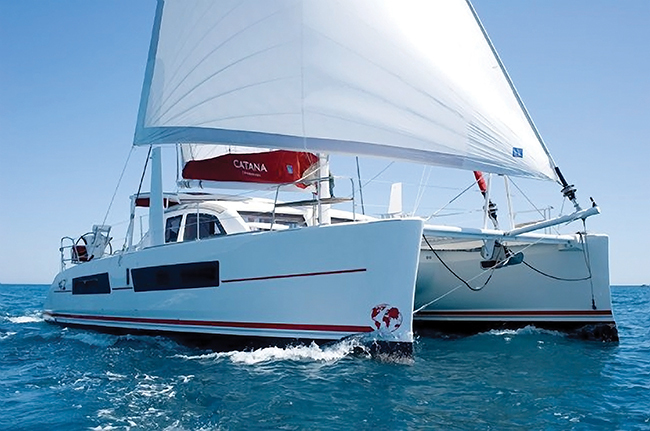 So this year, Jeanneau is launching the Sun Odyssey 379 and Sun Odyssey 439. The 379 has a modern hull style with a nearly plumb bow, a squared-off transom and a low slung coach roof. The sloop rig has been set up for ease of handling and good performance. The mainsail is a slab reefed full batten main with lazy jacks. The mainsheets run aft on both sides of the coach roof to the cockpit winches, so the helmsman can trim while steering. The cockpit has been laid out for efficient sail trim. With twin wheels, access to the fold-down swim platform is excellent. Below decks, the 379 comes in a two- or three-cabin version, both with a large head and separate shower stall. In the two-cabin version, the port quarter becomes a huge sail and storage locker and a small wet locker adjoins the head. In the three-cabin version, the port quarter becomes a sleeping cabin and the head is moved forward. The L-shaped galley is useful, and the dinette forward seats six with the drop leaf raised. Specifications: LOA 37’0”; Beam 12’0”; Draft 5’0”; Displ. 14,740 lbs. ; Sail area 753 sq. ft. The new JEANNEAU 439 has a larger, beamier Philippe Briand hull that will translate into greater cabin volume and stability. The bow sections have a bit more hollow for a narrow entry, which will improve the boat’s motion and windward ability. Like its little sisters, the 439 is all about good sailing aboard a comfortable boat. Twin wheels give the helmsman great visibility forward and open the cockpit to the large swim platform. Down below, the 439 makes use of the extra beam to offer an unusual four-cabin, two-head layout with two double quarter cabins, a V-berth cabin forward, and an upper and lower cabin forward of the main bulkhead. In the three-cabin, two-head version, the forward cabin gets a large centerline double berth and a large vanity or desk. The saloon has the seagoing galley aft and to starboard, where it is convenient to the cockpit and large dinette. The fit and finish of the 379 and 438 is bright and airy, and multiple hatches and ports provide natural light and excellent ventilation. Specifications: LOA 44’0”; Beam 14’0”; Draft 7’0”; Displ. 21,736 lbs. ; Sail area 1,004 sq. ft. The 44 DECK SALOON (DS) Sun Odysseys are all about elegance, style and comfort. From the swim platform aft to the bow rollers forward, the 44DS embodies the latest in Euro styling. The Philippe Briand designed hull is similar to the 439, but there the similarity ends. The deck saloon cabintop has a kind of Audi TT curve that flows for the full length of the cockpit and cabintop to the foredeck. The huge side windows are tinted black and set off by dark gray moldings that run along the edge of the cabin. 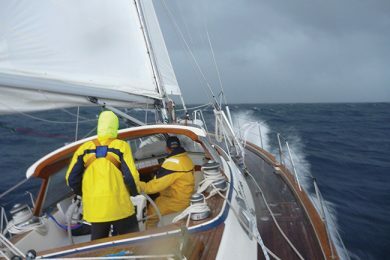 The halyards, sheets and control lines from the mast run in conduits on the cabintop, and the two-ended mainsheet runs under the deck to winches aft by the twin wheels. The 44DS has a huge aft cabin, with a queen-size double berth under the cockpit and bridgedecks. For added headroom, cockpit soles have been raised and a wide bridgedeck added. The cockpit has a large table with drop leaves and a built-in chart plotter. Down below, the furniture is more angular and the cabinets are lower with an “interior designer” feel, which is not surprising since the styling was done by Franck Darnet. The use of bright white and contrasting black counter and tabletops sets off the wood veneers, cabinets and bulkheads, and the sharp stainless steel latches and fittings are a statement in elegance. Aside from the full width after stateroom, the 44DS has two guest cabins forward and a second head. One of the cabins has a V-berth, while the others have an upper and lower single berth. The saloon is a trendy modern living space with a large galley, U-shaped dinette and bench settee. The 44DS will make a fine cruising boat for a couple or family who wants their leisure time to be as elegant and modern as can be. Specifications: LOA 44’0”; Beam 14’0”; Draft 7’0”; Displ. 21,450 gals. ; Sail area 835 sq. ft. For more information, call 410-280-9400 or visit www.jeanneau.com. The new OYSTER 625, which has been nominated for 2012 Boat of the Year in Europe, is a Rob Humphries design that dramatically upgrades the already popular previous boats in the Oyster line, the 61 and 62. A center cockpit desk saloon design, the 625 has a modern sheer line capped by the new style of wraparound deck saloon windows that Oyster has used so successfully in recent models. The standard rig will have an in-mast furling mainsail and a cutter rig forward. This gives you a lot of trim choices and allows you to shorten sail in rising weather without leaving the cockpit. A Solent headsail rig and in-boom mainsail furling are options. Down below, the 625 offers a true master stateroom aft with a queen-size double and plenty of storage and comfortable amenities. An owner and spouse will really feel at home here. Forward, two guest cabins are shown in the standard accommodation plan—a Pullman double cabin to starboard and an upper and lower cabin to port. The forepeak has been reserved for a single crewmember, with access to one of the en suite heads that adjoin the forward cabins. The saloon is spacious and will be full of light. The dinette is huge and will seat eight. The galley is in the passageway aft to port and will be an excellent seagoing galley. The chart table at the base of the companionway is a proper navigation command central where you can mount all of your radios, sat phone, chartplotters and radar. Plus, the table is large enough to spread out an old paper chart. The new Oyster 625 is a handsome, high quality ocean sailing yacht that will keep you safe at sea, get you home quickly, and provide you with elegance and comfort along the way. Specifications: LOA 63’7”; LWL 56’7”; Beam 17’10”; Draft 9’2”; Displ. 73,854 lbs. ; Sail area 2,538 sq. ft. For more information, call 401-846-7400 or visit www.oystermarine.com. The SABRE 456 was launched late last year and has drawn a lot of attention from both Sabre owners and would-be Sabre owners. The Jim Taylor design is an upgrade of the Sabre 452 that was introduced several years ago with a new keel, new rig and modernized interior. On deck, the 456 has a large, secure cockpit with high seatbacks and a single large destroyer wheel. The main sheet runs to the traveler forward of the dodger so the cockpit is not cluttered. The chainplates for the shrouds are well inboard for close sheeting angles on the genoa and to make going forward easier. Down below, the forward cabin offers a large centerline double berth and a large en suite head with a separate shower stall. The guest cabin aft has a large double berth and plenty of storage space. The 456’s galley is one of the largest and best laid out in any boat of this size. Since you tend to live in the kitchen, the saloon has the feel of a large, homey country kitchen. The drawer-style pull-out fridge is an innovation that we feel sure will catch on in other designs. Sabre has revamped their interior joinery style with a slightly Japanese flair to the doors and cabinets, making great use of the spaces available and adding light to the cabins. Because the 456 is built to order, Sabre can really work with an owner to customize the boat to his or her needs. A fine offshore quality boat built in “Maine style,” the 456 will carry you across oceans or the bay swiftly and comfortably. Specifications: LOA 45’6”; LWL 38’4”; Beam 14’1”; Draft 5’6”; Displ. 27,150 lbs. ; Sail area 1,043 sq. ft. For more information, call 207-655-3831 or visit www.sabreyachts.com. The new Tim Jackett-designed TARTAN 4000, which was introduced last winter, embodies a lot of the new thinking that has gone into the boats and the company since it was purchased by Steve Malbasa last year. The new company is all about delighting customers with great boats and great service. The 4000 really speaks to that mission. The cockpit is large and secure, with twin wheels for easy access to the fold-down stern platform. The seats are contoured for optimum comfort around the stowable cockpit table or when sailing hard. Tartan used their patented Cruise Control Rig, which uses a fully battened mainsail with a double headsail rig that deploys an inner upwind jib and a larger reacher on the outer roller. 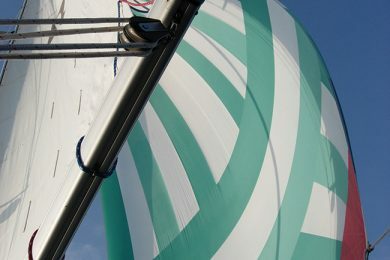 The CCR offers the best in both upwind and downwind sailing without forcing you to fly a spinnaker or even leave the cockpit. Tartan is unique in the market by offering carbon spars, booms and rudders as standard equipment. Equally unique are the epoxy-infused hull and decks that are tougher, lighter and virtually impervious to osmosis. Down below, the cherry interior has a large centerline double berth and en suite head in the forward cabin. The sofa-style saloon with a fold-down table will be comfortable for up to eight. The galley offers lots of counter space, a large fridge and double stainless steel sinks. 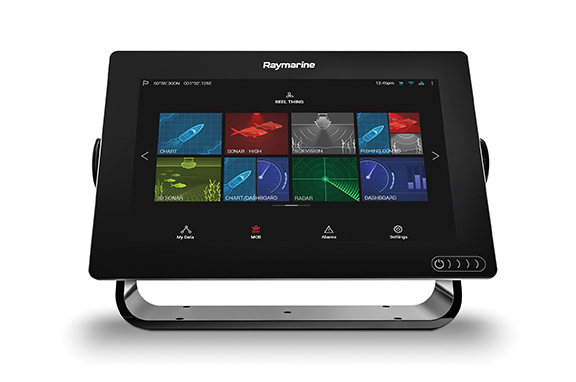 Across from the galley, the chart table is a traditional nav station where the skipper or navigator will be in command of all of the ship’s systems. A fine new entry to the 40-foot cruising fleet, the new Tartan 4000 will be a great couple’s boat and is built to be a family heirloom, albeit one that you could sail across the ocean. Specifications: LOA 40’ 8”; LWL 36’4”; Beam 13’0”; Draft 7’6”; Displ. 20,104 lbs. ; Sail area 893 sq. ft. For more information, call 440-357-7777 or visit www.tartanyachts.com. A semi-custom design that was spawned last year and launched late last spring, the new TARTAN 4700 expands upon themes introduced in the 4400 a few years ago. On deck, the cockpit is huge and deep and will be very secure at sea. With twin wheels and a folding transom, the living space will feel vast while at anchor and with the platform lowered. At sea, all buttoned up, you won’t mind running down the face of ocean rollers. The 4700 has Tartan’s Cruise Control Rig, so it is easy and efficient to sail upwind or off the wind and actually sails higher and faster than the 4400. The extra three feet add to the boat’s balance and waterline length, which translates into better performance all around. Down below, a lot of attention has been given to making the boat a comfortable family home with good communal and private spaces. The large aft cabin is tucked under the cockpit, and the bridgedeck has been raised to provide full headroom across the cabin. The large aft head is next to it to starboard. The 4700, like the 4400, has a raised dinette that offers good views through the deck saloon windows. And the chart table is raised as well, so you can easily stand watches inside the cabin with great visibility forward and to both sides. The engine room is beneath the raised saloon floor, where you have great access to the engineering systems. Forward, there is a large master cabin with an attached head and a third cabin with upper and lower bunks, which will appeal to children and their friends. A fine new model in the Tartan line, the 4700 is a liveaboard, offshore quality yacht that offers all of the attributes of Tartans—epoxy hull and deck, carbon rig, carbon rudder, Beavertail shoal draft keel—in an exciting new package. Look for BWS’s full review and the new boat’s specifications in the October issue. For more information, call 440-357-7777 or visit www.tartanyachts.com.